Ed Lewis Trucking, Inc. was founded in 2004 by Ed and Joan Lewis and they incorporated the business in 2006. From its inception with just one tractor shuttling trailers between dock locations for a local manufacturing facility, to the present, ELTI has experienced exponential growth. The company currently operates 70 tractors and boasts 170, 53’ food grade trailers. 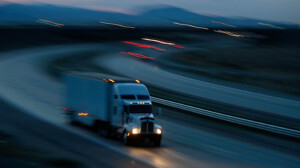 Additional freight transportation solutions include step deck and gooseneck trailers, and straight truck. At ELTI, we proudly deliver safe and dependable transportation to a wide range of customers situated throughout the continental United States and Canada. Ed Lewis Trucking is headquartered in Louisville, Illinois, approximately 100 miles east of St. Louis, Missouri. In just ten short years, Ed Lewis Trucking expanded their fleet from just four trucks (2006) to ten trucks (2010), and now has 70 trucks with plans to continue to steadily expand the fleet. From humble beginnings with only four employees, currently Ed Lewis Trucking has grown to 90 employees; which includes seven office personnel, 2 on-site mechanics, and full- and part-time drivers.